Four Nantucket couples. Their lives unusually intertwined. One tragic accident. Mourning and sadness all around. Guilt and mystery. Friendship. That pretty much sums up The Castaways by Elin Hilderbrand. The cover may look all happy and serene but inside the pages you'll find a tangled web of affairs, deceit, marital discontent, depression, death and despair. It's a summer read full of cloudy, tumultuous skies. Who are the "Castaways?" They are four couples: the MacAvoys, Kapenashes, Drakes and Wheelers. Over the years, they become really good friends. You know, almost a love rectangle times two (plus one, a student named April) with the classic "grass is always greener on the other side" scenarios. The rectangle gets completely thrown out of kilter when one couple, Greg and Tess MacAvoy, sails out to the Vineyard for their anniversary, hoping to patch their marriage back together, trying to leave behind the rumors that Greg had an affair with one of his students, April Peck. Instead, their boat capsizes and they drown. Their friends are left in a state of shock after the deaths and they all struggle to deal with unanswered questions and their own grief. Elin Hilderbrand is known for her riveting Nantucket summer reads, many of them bestsellers. The Castaways releases on July 7th. This is the first book by Hilderbrand that I've read. To be perfectly honest, usually I'm not really drawn toward books mired in affairs and the related complexities involved in such situations. I must say that I had a hard time believing that four couple's lives could become quite so intermixed. However, I found Hilderbrand's depictions of how each character handled stressful events intriguing. Her characterizations seem very real--the group dynamics even more so as each person plays a specific role within the "rectangle." I was also pleasantly surprised by the suspense in the book. I never lost interest while reading it. Hilderbrand tells her story in an interesting way, through her characters. The chapters alternate between the six bereaved friends, each one recounting details from his or her own point of view, each one reminiscing about past events and expressing present feelings. The mystery surrounding the drowning and the relationships between the characters drive the plot. If you are looking for an emotion filled book packed with plenty of drama, scandal and some soul-searching, you'll want to read this one. Win a copy! This review is part of Hachette Early Birds Blog Tours, and Hachette Book Group has kindly offered to giveaway (3) copies of The Castaways to 3 Brimful Curiosities readers. Perfect for summer reading. 3 COPIES! To enter, please answer the following question: In your opinion, what location would make the perfect setting for a summer/beach novel? Or, leave any comment relevant to this post. Thanks! I follow you and would love to be entered for this book! The perfect vacation to read would be on a cruise. How peaceful would that be? I added you to my twitter and did a post on the giveaway..
Well, of course, the perfect setting for any novel has to be London . . . hey, they have beaches there (well, when the tide goes out . . . um, briefly!). We spend 2 weeks in nantucket every year. I see these books in all the shops. I read Elin's latest and loved it (one sister was battling cancer at the beach). Thanks for the great giveaway. Would love to take this on my next trip! I have never been there myself, but from what I have heard the New Jersey shore would make a very interesting setting. The Florida Key would be another good setting. The Costa Del Sol of Spain would be perfect for a summer beach novel. This is a beautiful area with wonderful beaches. I don't get there very often, but out East, on Cape Cod, it's just how I picture summer. I'd love to see a beach book set on the Alabama coast. I love the Gulf of Mexico and it's been years since I've seen it. Florida's gulf coast of course. The coast of Vancouver Island, British Columbia, Canada is a great setting. It's wild, it's pretty and remote, and something unexpected could definitely happen. I think that the beaches of Nice, France would make an appealing location. I love the East Coast and think that Maine would be the perfectlocation for a beach novel. But one location I think even would top that is a beach at Hull, MA. There's some gorgeous spots at Hull and some fabulous Bed and Breakfast facilities. Love the East and West Coasts, but I don't read many books that feature the beaches and towns around Lake Michigan which are also lovely. I subscribe to your feed too! I am a big Hawaii fan. Besides if you can't go you can always read a good book about it and pretend! I don't know. I think maybe a summer/beach novel that takes place on an Australia beach might be cool! Reading a summer book about a summer place sounds like a terrific idea, thanks for the chance to win. This book sounds like a really great read. Please enter me into the giveaway. Aside from the obvious places like Hawaii and Maine, I would love one to take place at Disney World. Thanks for the opportunity. The beaches around Savannah Ga would make a nice setting. I'd say Cape Cod but frankly it's too cold up here. We have the most wonderful small town swimming holes(that's what the kids call them) So I thinks any Small town swimming hole would be very romantic and close to every-ones heart. St. Andrew's Beach in Panama City, Florida. It's beautiful there. I've only ever been to the beach a few times, but I've always dreamed to going to one in Maine. I think it'd be a beautiful setting. Probably a Caribbean or Mexican beach somewhere. When I think of summer, I picture Cape Cod. Or maybe the Outer Banks. I think Kauai is a perfect locale! Clearwater Beach FL! Its beautiful there, the sand is white, the water is clear and a beautiful blueish/green its like a paradise! Thanks for the chance to read this book. I don't make it to many beaches, but a remote beach in Nicaragua would be pretty! Whidbey Island off the Washington coast just west of Seattle. There are actually several islands there and the weather is much milder than on the mainland. The summers are great and there is a lot of wilderness. You can rent a cabin that is far away from anyone else. I love it there. No crowds, no traffic, just peace and tranquility. And if you want the big city for the day, it is just a ferry ride away.We actually fly from Alabama to Seatle to enjoy the islands there instead of Florida which is overcrowded and over heated. I collect books from coastal locations I just love settings like that because it's my favorite place to go!! I love stories that take place on the islands, which technically i'm happy with just the beach setting also!! I'm happy to see this giveaway (and now have this book on my "gotta read" list)! I read Hilderbrand's "Barefoot: a Novel" last year and LOVED it! She really makes you know the characters and has great story development. Am hoping this book is the same! Give me the beach up north in Michigan during a wonderful hot summer. I think Panama Beach, FL would make a good one. 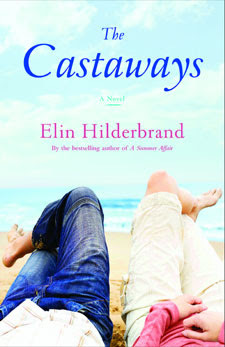 The Castaways by Elin Hilderbrand sounds wonderful. Thank for the amazing giveaway!!! Have a great weekend. augustlily06(at)aim(dot)com, Thank you. I think the Florida Keys would be a fun setting. The reviews of this book have me dying to read it. Sounds great. Thanks so much! I just signed up to follow!! In my opinion, the beaches of the Outer Banks make the perfect setting for a summer/beach novel. I would love to be included in your giveaway. I think Myrtle Beach would be a greating setting for a novel. I would love to read a novel set in Newport, Rhode Island. It's one of my favorite places, and I think a great setting. Thanks! I already follow your blog on Blogger--thank you so much! Mackinac Island would be a good place for a good beach read. The absolute BEST place for a summer/beach novel is in Marco Island, FL on the outerbanks of Tigertail Beach. Crystal clear blue waters, quiet, peaceful, and amazingly beautiful. Check it out! The perfect setting would be in Maui, nicely secluded and beautiful. I have only been to the beach twice, once to Panama City Beach and once to Myrtle Beach. Hands down, Myrtle Beach would be perfect for me. I think Greece would be perfect. Posted under current giveaways on my blog. crystal cove-it is beautiful and where Beaches was filmed. I think that the perfect location for a book I'd read on the beach is anywhere in Italy. I love the idea of lounging on a beach and reading a book that takes place in Italy! I think the perfect setting would be in San Diego,CA or Cabo! I like to read books that take place at a beach. I think a good location would be Ocean Beach in San Diego-a lot happening in that area. A Perfect location would be a beautiful little island we have here in Ohio.. Put In Bay.. it is gorgeous up there especially in the summer.. I think the beach of Wilmington, NC would be great. It has a great university and all kinds of historical places. They have carriage rides and a cobblestone street right on the water. How about an exotic locale...like Casablanca, Morocco? Hot and steamy south! Maybe Tampa? A rocky beach off of Cape Cod. I am an e-mial subscriber.